Towing your boat to the water can be a risk, especially if the hitch does not work correctly or if your boat swings all over the road. You don’t want your boat crash into someone else’s car or to flip on the side of the road. When you’re towing a boat, make sure that you slow down and keep alert to the other cars around you. If you need to stop suddenly or swerve, that extra weight can cause your car to fishtail or can cause the boat to jackknife. You don’t want to be in that situation. Leave extra space between vehicles around you and your own car. When turning corners, make sure that you ease into the turn carefully, accounting for the extra weight of the boat. Give yourself plenty of time to brake at intersections and traffic lights and avoid trying to pass others on the road. Make sure that your boat is packed so that the weight is distributed evenly. Make sure that any items in the boat are properly secured to that they don’t move. Use tie downs at the front, rear, and side of the boat to keep it from moving. Use a proper trailer with trailer lights that are working. 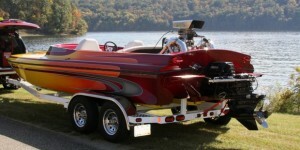 For a larger boat, you might need a trailer with heavy-duty suspension or a very high capacity tow bar. Carefully read the manual that came with your boat or ask for professional advice to make sure that you use a trailer that can handle the boat’s weight. Also, look into trailers that offer extended side view mirrors which allow you to see around blind spots that the boat trailer will inevitably create. If you’re driving your boat over long distances, check periodically to make sure that your boat is still properly tied down and the tow bar is still in good shape. Tighten anything that needs tightening and make sure that nothing has come loose. Giving yourself plenty of time and taking the proper steps now can help you avoid a serious Fort Lauderdale collision involving your trailer, boat, and car. Keep in mind that if you are in a car accident involving your boat and car, your property damage can be considerable. If you have been in a car accident in Ft. Lauderdale or Florida while towing your boat, contact Flaxman Law Group. You may need to recover extra compensation to pay for damage to your boat, car, trailer, and other property. In addition, you may face severe injuries and medical costs as a result of your accident. The team of attorneys at our law firm can help you investigate the total likely cost of your injuries and can help you pursue compensation if you qualify.